The NRIs (Non-Resident Indians) are confused when it comes to taxation issues especially related to rented income, a sale of real estate and other investments etc. Here is a complete guide to explain about tax implication for NRIs. One of my friends has recently moved to Canada. He has income from property in India. Apart from that, he has income from other sources in India. He wants to know about the applicability of income tax for NRI. He is also confused about filing Income tax return. So, in this post, let’s try to address common tax related queries asked by NRI. Who is considered as NRI? Income tax act provides conditions for a resident of India. If you don’t satisfy the condition for a resident of India, you will be identified as NRI. Your resident status will decide your income tax liability in India. If your status is ‘resident’ your global income is taxable in India. If your status is ‘NRI’ your income earned in India is taxable in India. If you are NRI and you receive a salary in India or someone receives it on your behalf, you are liable to pay income tax on such salary. This means if you render service outside India and accept a salary in India, you need to pay income tax on salary income. E.g Mr.Suresh Works in IT firm. IT firms take a project in Dubai and depute Mr.Suresh for project work. Mr.Suresh opt to take a salary at India. Mr.Suresh is liable to pay tax on salary income. The most common source of income of NRI is rental income. Most of NRI rent out their properties and receive monthly rental income. Any income arising from rental property for NRI is taxable in India. This income is taxed as per income tax slab rates. A tenant who pays rent to an NRI needs to deduct TDS at 30%. A tenant needs to prepare 15CA and submit it online to the income tax department. This is irrespective of payment is made in bank account located in India or at abroad. Income from any other sources in India is taxable for NRI. Few examples of other sources include interest income earned on NRO bank account, fixed deposit etc. The interest earned on NRE or FCNR account is not taxable. In short as an NRI you need to sum up all income originated in India or received in India. If your total income in India is crossing income tax threshold limit you need to pay Income tax. 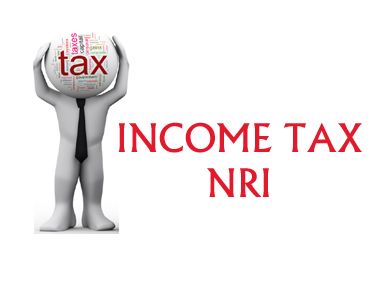 NRI is also liable to pay tax on any income arising due to business and profession in India. This means if you have business setup in India or controlled in India you are liable to pay tax. NRI is also liable to pay long-term capital gain tax and short-term capital gain tax. This means any capital gain arising due to a transfer of capital asset which is situated in India shall be taxable in India. However, the certain special tax treatment is offered for specific investments. The tax rate applicable on such investment is 20% provided NRI has no other income except special investment during the financial year. The special investment includes following investment type. Deduction for such investment is not considered under 80C for NRI. However, in case of long-term capital gain, one can avail an exemption on the profit under section 115F. After looking at a taxable income of NRI, let’s take a look at deduction and exemptions applicable to NRI. Most of the deductions under 80 C are allowed to NRI. Some examples are insurance premium, children tuition fees, principal repayment for a home loan, ULIP investment and Investment in ELSS. NRI is also allowed to claim deduction under 80D for a premium paid for health insurance policy. NRI can claim a deduction for the interest payment on education loan. The loan may be for the higher education of NRI or for spouse and children. Another deduction which is allowed to NRI is under section 80G which is for the donation made under a social cause. NRI can also take benefit of 80 TTA. It is towards interest income on saving bank account. The maximum limit is Rs.10000. When NRI is required to file Income Tax Return? If Total Income is crossing taxable limit during a financial year. This means as per current rule if total income of NRI in India is above 2.5 Lakh, one need to file Income tax return. If TDS is deducted from your Income and you are looking for refund as your income is below taxable limit. If you have Short term Capital Gain (STCG) or Long term Capital Gain(LTCG) from sale of assets or investments in India even if your income is below basic exemption limit. Suppose you want to carry forward and set off any losses against gains. If you want to claim tax benefit under tax treaty even though your income in India is below threshold limit. « ASM List – What to do in ASM list Stocks?